The efficient market hypothesis got a bad press after 2008. Not surprisingly. It's a half-truth. For instance, what Robert Shiller identified as genuine mispricing Robert Lucas called a minor deviation. Also, the hypothesis has many interpretations, and here's one of them. On the left we have the mean of money that startups received over their lifetime. On the right is a rude measure of risk: the ratio of acquisitions to closed companies in the respective market. So, enterprise software has three successful acquisitions per one failure. I dropped "operating" startups because it's difficult to interpret their success. 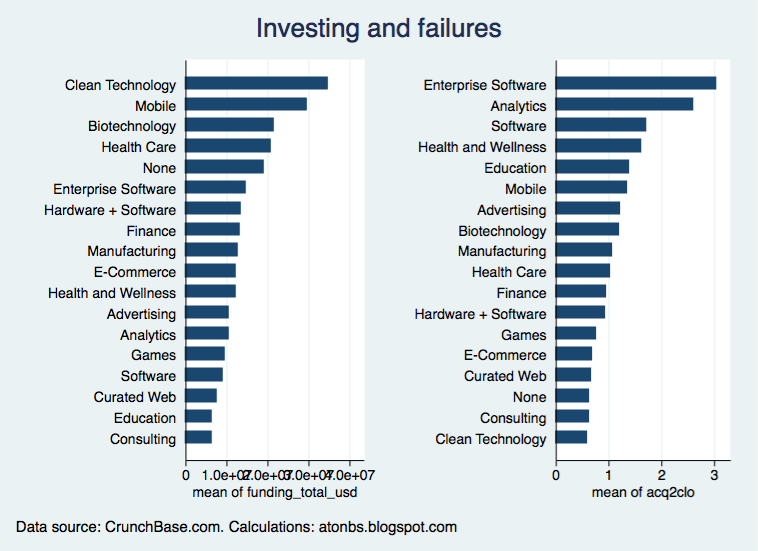 The graph is interesting because clean tech gets much funding but has one acquisition per two failures. Analytics gets small funds (not so sexiest as it was called? ), but gives very stable outcomes. These two are exceptions because in general funding match the risk measure. And so in other markets: it's enough for one product (like housing) to have abnormal pricing for the entire market to be under risk. That is an attempt to make complex things embarrassingly simple, of course. For example, some may insist that average funding is a measure of capital intensity, not of competition among investors. Or what we should honestly calculate returns, as was done here. But it all seems to be half-truths, including this piece. We have to keep watching.